Two weeks ago, I had the honor of attending the Etude House Pink Play Part as an ambassador of Etude House. The theme of the party was "Play, Talk and Sing". I had a wonderful time, and it was such a fun and memorable night! The highlight was definitely seeing Shinee perform life. 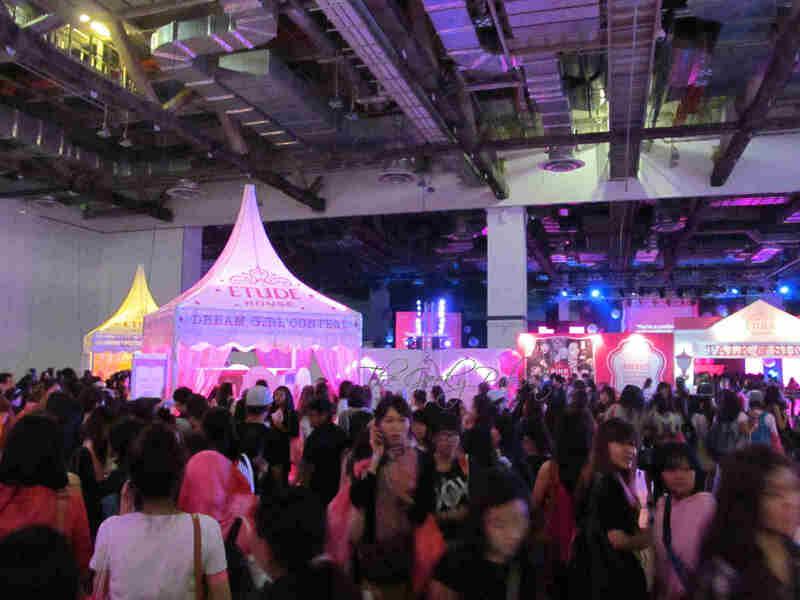 The event was extremely crowded! 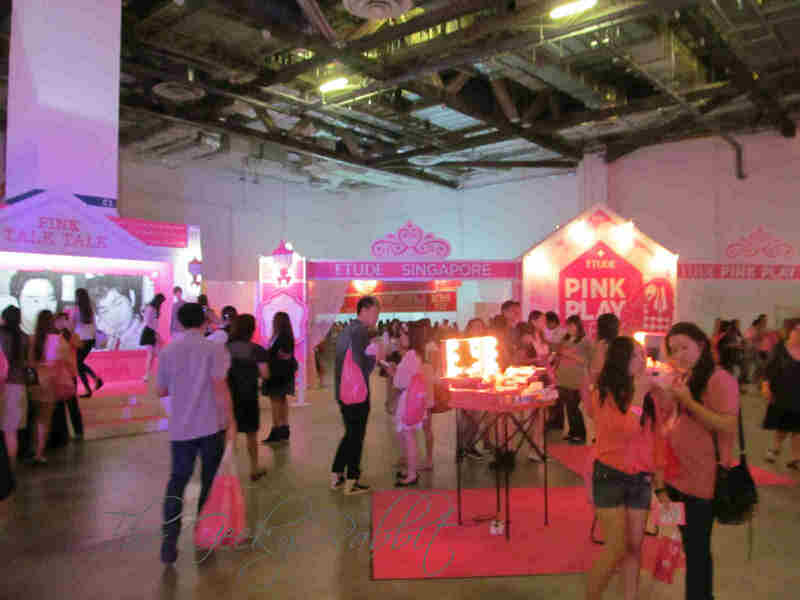 After entering the premises at Marina Bay Sands Convention Center, there were several booths that you could play games and gain a stamp in the "Beauty Passport". There were many people but I managed to finish all the tasks in under an hour. There were three main tasks to complete- one was to take a selca with the Shinee life-sized cutouts. 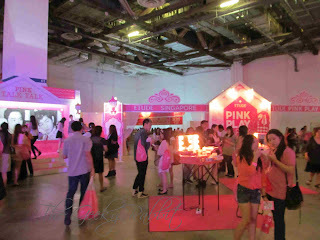 The next was to try out the nail colors at the nail art corner. The other task was a choice between two games- one was involving a ball toss and the other was to apply mascara. 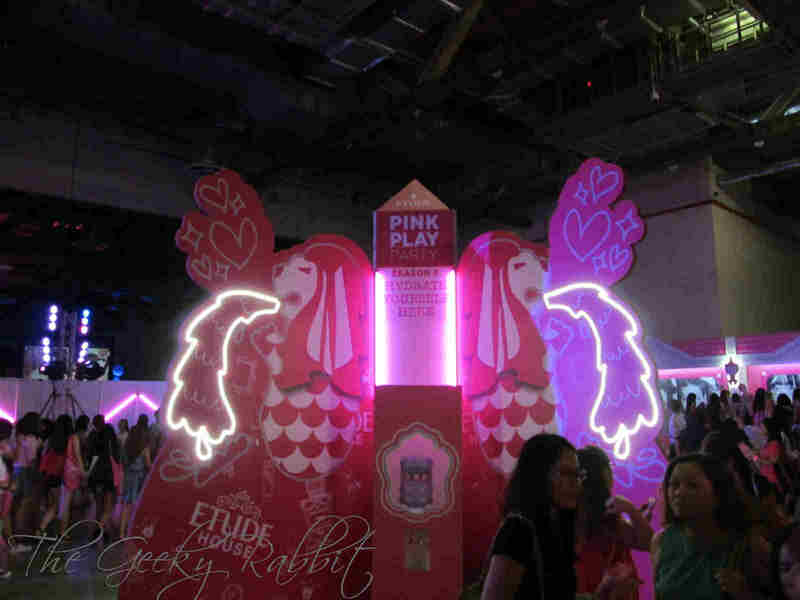 There was also various makeup areas where you could try out the latest products from Etude House, including the Color Pop collection. Definitely a treat for makeup lovers! 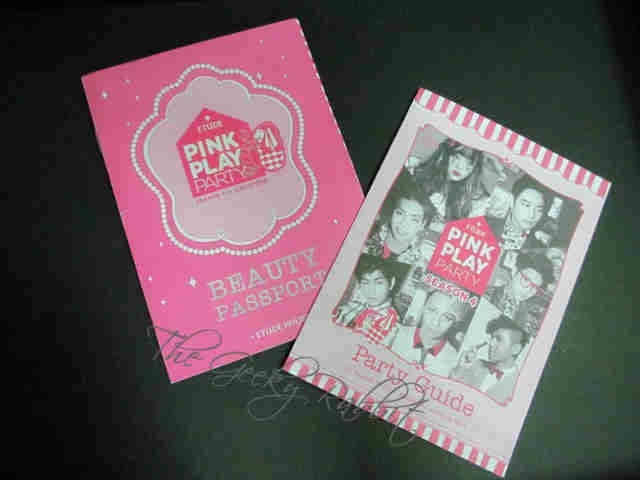 Once you obtain 3 stamps in the beauty passport, you can then enter the "Talk and Sing" area. The event started with a makeup demo by Kevin 老师, a renowned makeup artist from Taiwan. He offered tips of doing a quick makeup look, all under 10 minutes. He also shared about the newest Etude House products! Sulli from f(x) also appeared on stage briefly to present prizes to lucky winners of the lucky draw conducted. Of course, after the demo, Shinee also performed during the "Sing" section. They danced and sang to four of their top hits- Lucifer, Beautiful, Dream Girl and Why So Serious. The crowd went wild with cheers and screams when the boys came on stage! I enjoyed their performance. Each attendee was gifted with a goodie bag. It had lots of goodies inside! We could also redeem a popcorn and Pink Pong Water (not shown here, as I consumed those during the concert!). The Pink Pong Collagen Water is not yet available in stores for the Singapore Etude House outlets, but it's fount on the Korea website as seen here. It's a really interesting product. Not too sweet, and good for quenching thirst during the concert too. The popcorn was very unique too- it was a light shade of pink. Tasted great, and I thought the pink tone was something really uncommon! 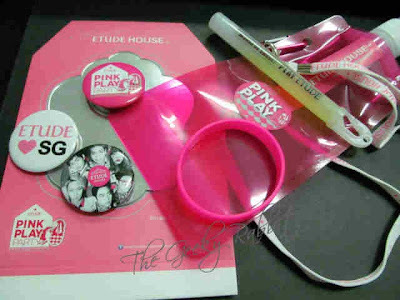 The other goodies in the bag includes 3 pins, one rubber wristband, a glowstick, a water pouch with a gorgeous Etude House lanyard and mini carabiner, a mirror and a couple of samples and vouchers. 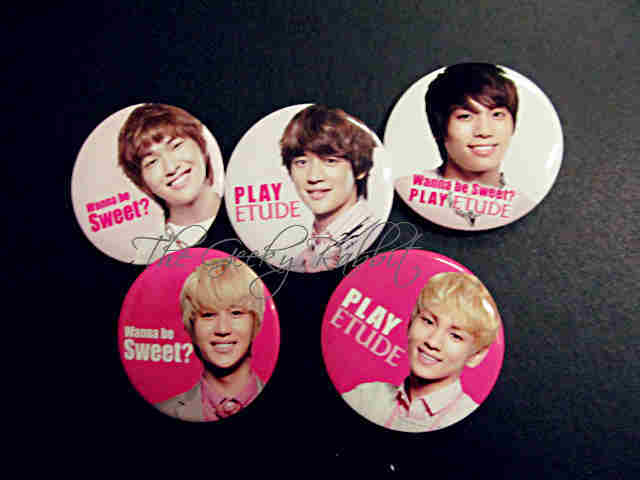 During the game segments, pins were also given out. Different stations had different pins, and I am glad to have collected all 5 different pins for each of the Shinee members! The best item of the night has got to be the lanyard, which was given out at the Selca booth. 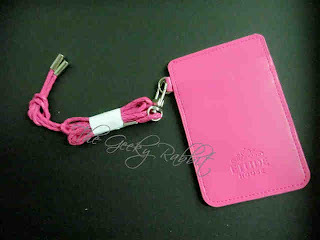 It's pink and is made of really good quality faux leather. Definitely something very useful! 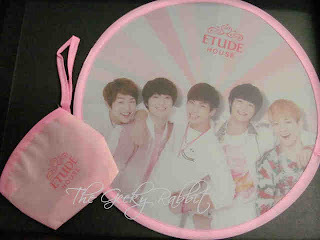 Since Shinee is the representative for Etude House this year, there were memorabilia given during the games. It's a real treat for Shinee fans. 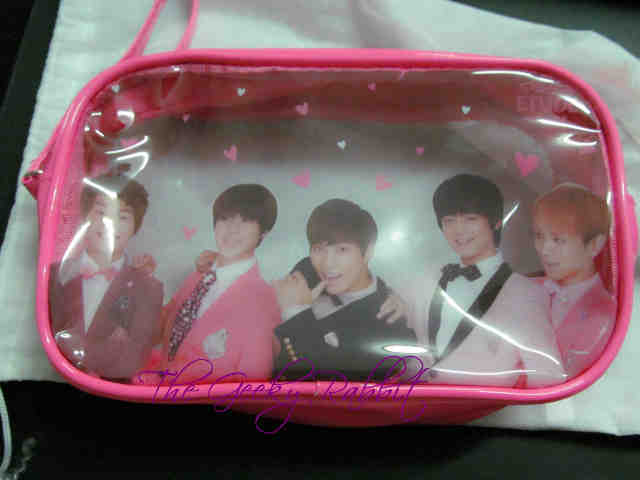 I got a foldable fan (above) and makeup pouch (below) during the games. The Pink Play Party was definitely a once in a lifetime experience, and many thanks to Etude House for the invite! 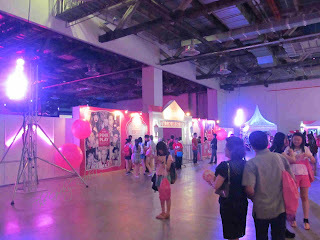 I had an awesome time and also got to know other Etude House fans, and Shinee fanatics during the concert. I had a blast at the concert and seeing Shinee and Suili live in action was an unbeatable experience. 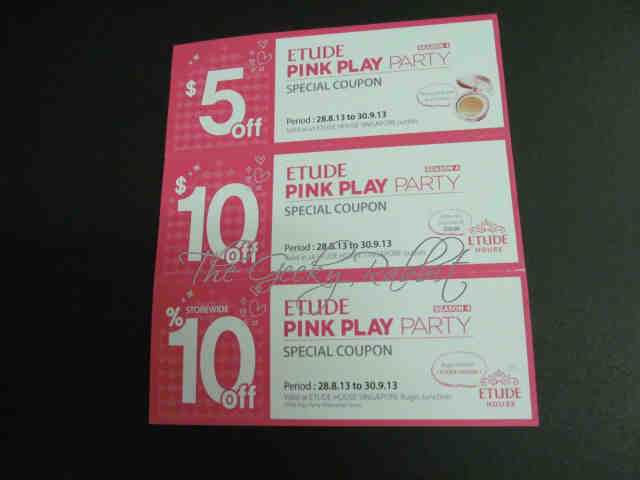 Update: here's an official video on the Etude Pink Play Party, from Etude House Korea! Enjoy!